The 1927 season was full of hope after winning their first World Championship in the previous season. However, Rogers Hornsby was gone as he was traded (for Frankie Frisch which was wildly unpopular) after leading the team as the player/manager due to a tirade against the owners of the Cardinals. December 20, 1926: Rogers Hornsby was traded by the Cardinals to the New York Giants for Frankie Frisch and Jimmy Ring. In a deal that shocked the baseball world, the Cardinals traded long-time star Rogers Hornsby on December 20, 1926 to the New York Giants for Frankie Frisch and Jimmy Ring. The deal was held up because Hornsby, as part of his contract as the manager of the Cardinals (he was a player-manager at the time), owned several shares of stock in the Cardinals. Cardinals owner Sam Breadon offered Hornsby a sum for the stock considerably lower than what Hornsby demanded for it, and neither would budge. Eventually, the other owners of the National League made up the difference, and the trade went through. The Cardinals scored in the first inning but didn’t score again and lost 10-1 to the Cubs in the opener. Here is how the first inning played out as there was an overflow crowd standing in the outfield. Taylor Douthit doubled to right. Billy Southworth reached on a fielder’s choice (one out). Southworth was almost picked off but the pitcher made a throwing error and he went to second. Frisch filed out to center and Bottomley followed with a walk. Bell doubled to left and then Hafey struck out. That was the only Cardinals run in the season opener. On May 14th, tragedy happens when the Cardinals are playing at Philadelphia’s Baker Bowl. a section of bleachers collapses during the seventh inning and at least 50 people are injured and one dies of an apparent heart attack. The Cardinals lost 12-4.
three-run homer after a Douthit double and a Frisch single. The Cardinals end with a stellar record of 92-61 but are in second place by 1.5 games. 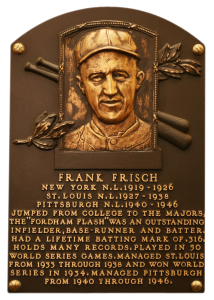 Also, Cardinal fans that were unhappy with the acquisition of Frankie Frisch are now ecstatic as he fans only 10 times in 153 games and led the National League with 48 stolen bases. He was second in MVP voting. O’Farrell is replaced as manager by Bill McKechnie.